During the Third Century, the tribes still acted as a loosely based military alliance, but their capability was demonstrated in 286, when seaborne raids by Franci, Saxones (from Germany), Picti and Scotti forced the Romans to establish a specialised naval force to clear the seas of pirates. In 305-6 Roman forces were embroiled in a major military campaign in Barbaricum in the north, and, in 360, further seaborne raids by Picti, Scotti, Saxones and Attacotti led to the despatch of a senior general to Britain in winter-time in order to deal with the emergency. However, this proved to be a dress rehearsal for a much more severe assault on Roman Brittania. 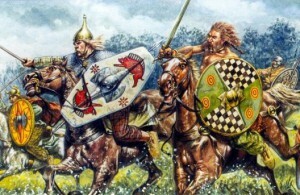 The Barbarian Conspiracy of 367-68 involved the same confederation of Pictish, Irish and Germanic tribal forces that had plundered Britannia a few years earlier, but the attacks were carefully coordinated and much larger in scale, and they were aided by Roman frontier scouts, or araeni, who betrayed the Roman province by providing their commanders with inaccurate information. 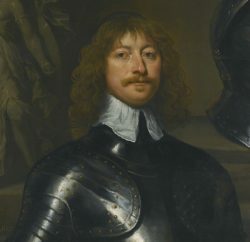 Faced with the formidable barrier of Hadrian’s Wall, the Picti and Scotti simply sailed round, whilst the Attacotti attacked the Welsh and south-west English coasts and the Saxones targeted the channel coast. North-west England was ravaged by the Scotti, and Cumbria was reduced to dust and ashes for a generation. 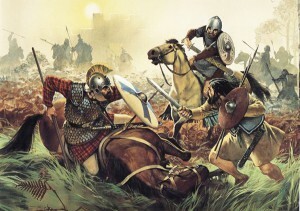 Although the Pictish forces concentrated their attention on north-east England, some of their raiding parties reached as far south as London, where they joined their Saxon allies in looting the Roman British capital. 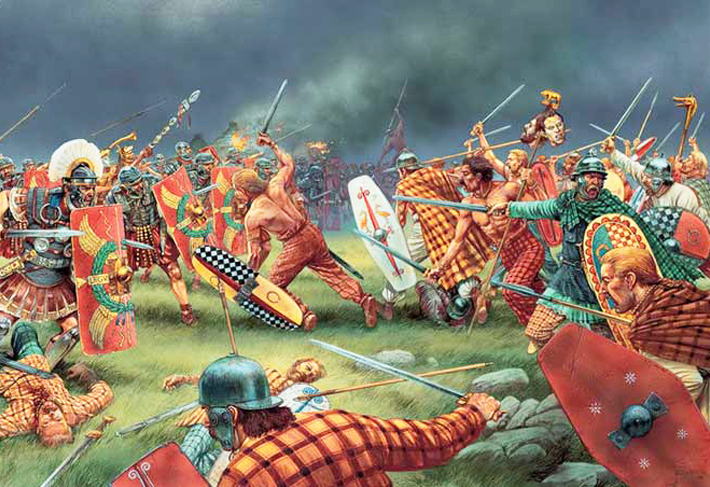 The commander of the Roman army in Britain was ambushed, and Roman losses were unprecedented. When the Roman general, Theodosius, arrived in southern England in the autumn of 367 to retrieve the situation, his forces were immediately engaged in fighting marauding war bands in the vicinity of London; and the raiders were still at large the following year, leading to further military action by land and by sea. After he had eventually restored order in the south, Theodosius reportedly recovered an entire – but unidentified – province; and the treacherous areani were summarily dealt with and disbanded. 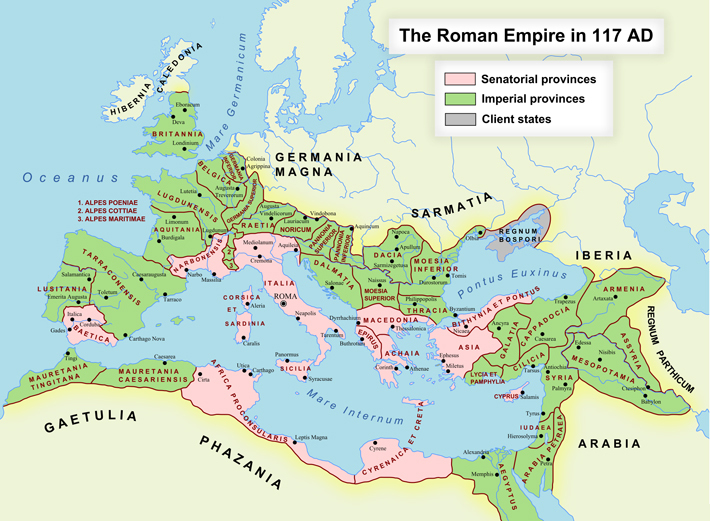 The fullest account of all this comes from the Roman, Ammanius, who wrote during the emperorship of Theodosius I, the grandson of the Roman general who restored order to Roman Brittania. 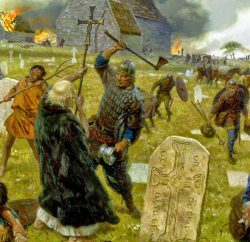 Some historians have attempted to downplay the significance of the ‘Barbarian Conspiracy’, arguing that it was far less of an emergency than Ammanius claimed, but that doesn’t explain the archaeological evidence of widespread destruction in coastal Cumbria and Yorkshire. In the period following 367-68, the Romans established a new network of coastal defences and signal stations on the Yorkshire coast, and instituted a thorough re-organisation of military forces in Britannia. Despite these new security measures, further conflict followed in 382-83, when Roman chroniclers reported a military victory against the Picti and Scotti, and again between 396-98, when Stilicho was reported as campaigning against the northern barbarians. These campaigns were most likely aimed at halting the naval war bands from northern waters that were now regularly raiding the Roman province. Sea raiding had become a rite of passage for young warrior Picts. Each spring, flotillas of seven bench currachs – described as ‘black’ due to the pitch used to insulate their ox-hide hulls – were launched from beaches, inlets and coves right along the north-east Scottish coast to terrorise and plunder Romano-British coastal and riverine settlements. They returned with their booty of human cargo, along with silver, bronze and gold ornaments, most of which would be melted down and transformed into stunning torcs, silver chains, massive armlets and delicately worked brooches. The Pictish sea raiders were proto Vikings. In the early 400s, during the last days of Roman Britannia, Angle settlers were increasingly making new homes in north-east England, as a mercenary force hired to protect their Romano-British hosts from the Orcs, the Angle word for devils – a name now familiar from Lord of the Rings. Roman Britannia was now being repaid in kind for the genocidal invasions that a succession of Roman emperors had launched against the proto-pictish heartland. As summer raiding became a key cultural and economic marker of Pictishness, the peasant warrior communities of north-east Scotland became increasingly militarised. 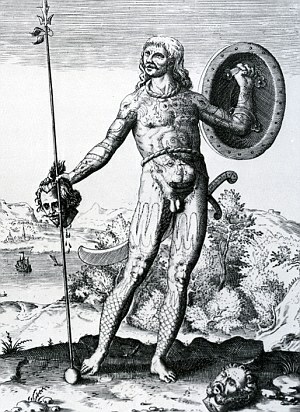 The economic opportunities opened up through piracy and pillage led to the establishment of permanent groups of young Pictish warriors who were freed from the necessity of agricultural labour and who owed allegiance to a new class of Pictish warrior lords, which probably explains why Pictish raiding parties were able to remain in the field for so long during the Barbarian Conspiracy of 367-68. 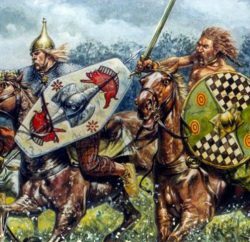 It is interesting to think that the glories of early Pictish culture originated from pillage and opportunism against Roman Brittania. In the next and final article of this series we will look at the emergence of Pictland, in the post-Roman period, as the first nation of the British Isles, pre-dating even the idea of England by hundreds of years. Article written by Dr. Anthony Cox, a lecturer in history at the Centre of Continuing Education, University of Dundee.